The Punisher is finally out on Netflix and, as expected, it features Jon Bernthal killing tons of bad guys as New York City's most dangerous vigilante. Television is primarily a visual medium, but sound is just as important - arguably even more so. Tyler Bates' score has already garnered acclaim for its rusty metal vibes and western-tinged guitar work, but the show also makes substantial use of licensed music during important moments in the story. The lyrics and mood of just the right song can transform a scene from a typical plot beat into a stand-alone work of art. The first epic trailer for the series made excellent use of "One" by Metallica. The song, based on the book, Johnny Got His Gun, by Dalton Trumbo, is a brutal anti-war anthem about a World War I veteran who loses all his limbs in combat and exists halfway between life and death in a state of endless and excruciating pain. It's a song which perfectly sets the bleak and nihilistic tone of The Punisher, though it sadly never plays during the series proper. While the music of Metallica never actually appears in show (only the trailer), a slew of other tunes highlight key scenes throughout the series. This is Screen Rant's guide to the licensed music of The Punisher. Beware of MAJOR SPOILERS for the entire series! The first episode of the series, "3 AM," starts off with a bang, with Frank Castle completing his revenge (or so he thinks) and essentially retiring from his life as The Punisher. He takes up a construction job, and refuses to intervene when some of his co-workers decide to rob a mafia-run card game. It doesn't end well, and they decide to murder the young newcomer to their crew who accidentally revealed his identity to the mobsters. They throw him into a pit and start filling it with cement. Castle, armed with a sledgehammer, asks them to turn off the machine and let the boy go. They refuse, and blood is spilled. When Lance, the leader of the gang of brutes, raises his gun at Frank, he springs into action and sets about disarming, disabling, and killing each of the would-be murderers. As he strikes his first blow, "Hell Broke Luce" by Tom Waits begins to play. First released on the 2011 album, Bad As Me, "Hell Broke Luce" is a vicious indictment of militarism, with a self-loathing soldier bemoaning the futility of war, lamenting the impending deaths of strangers, scowling at generals, and cursing the politicians who condemn so many young people to go off to fight and die and reward them with an empty gestures like parades. Waits' signature guttural growl and a bitterly violent arrangement of heavy drums and distorted guitars add a visceral impact to the imagery of Frank Castle unleashing his pent-up rage on the group of thuggish bullies. In episode two, "Two Dead Men," Homeland Security boss Carson Wolf (C. Thomas Howell) goes home after a long day of being a crooked cop, and puts on some music before heading to the kitchen for a snack. His song of choice is "Ain't That a Kick in the Head?" by Dean Martin, the coolest member of the Rat Pack. Unlike the Tom Waits entry above, the lyrics aren't directly applicable to the situation or characters at hand, though an argument could be made that Wolf, as a corrupt agent, is undeserving of his power and status in the same way as the subject of the song is undeserving of the love of the woman he sings about; he just got lucky, is all! In any case, the scene quickly shifts gears when Wolf is attacked in his home by The Punisher himself, and a dirty brawl ensues, in which it is obvious that Howell does many (but not quite all) of his own bone-crunching stunts. The fight ends with Wolf being knocked unconscious by getting his head slammed down hard on his dining room table, perfectly timed with the closing notes of the song. One has to wonder if the scene originally ended with Wolf taking a kick to the head, but if it was changed to avoid being too in sync with the song. Episode three, "Kandahar," sees Frank have an extended flashback to his time in Afghanistan. After his unit is ambushed, he enters the highly guarded base full of enemy combatants and proceeds to kill everyone he sees, switching from his assault rifle to his side arm, then to his shotgun, and then even to an enemy's AKS-74U. When a stray bullet knocks him down, a melancholy song begins to play. It's "Wish It Was True," by The White Buffalo. 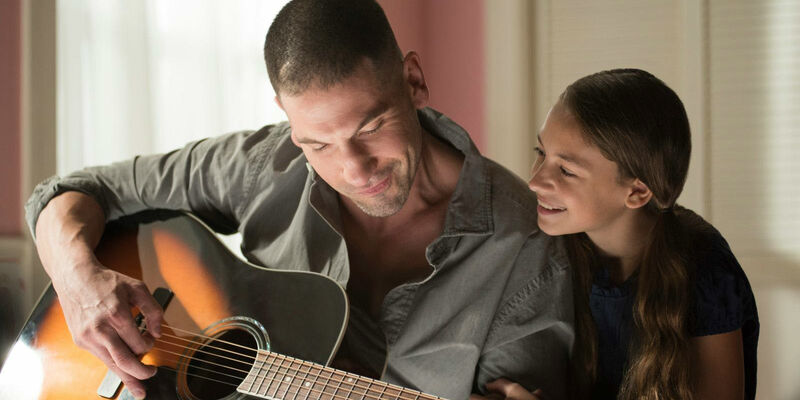 The soulful folk song had previously been used in a season four episode of the hit FX show, Sons of Anarchy, and both that show and The Punisher are painful deconstructions of American masculinity. The lyrics involve a narrator wistfully wishing he could be a better man to his parents but sadly lamenting that he can't correct his mistakes. As the song goes on, the song serves as a stirring indictment of war, with the heartbreaking lyric: "Country, I was a soldier for you; I did what you asked me to; It was wrong and you knew... The home of the brave and the free, the red, white and blue; I wish it was true." The song continues to play its bitter message as Frank bludgeons an enemy to death with a heavy rock and just keeps on pounding. The viewer is spared the grisly sight of the victim being beaten to a pulp, but is instead forced to see something even scarier: Frank Castle, consumed by war and bloodlust, killing off his own humanity with every blow inflicted on the enemy.